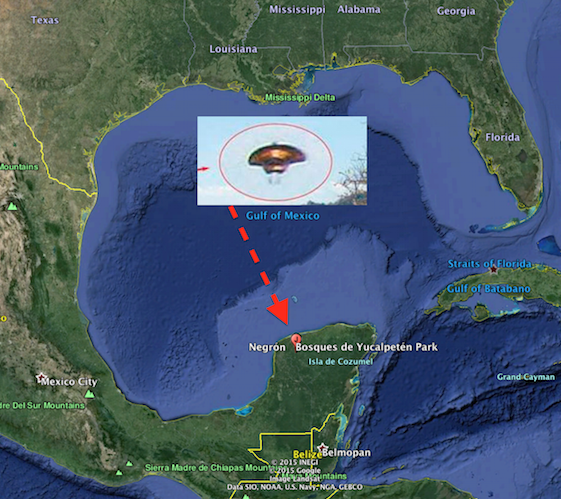 UFO SIGHTINGS DAILY: UFO Caught Close Up Over Ocean In Yucatan, Mexico On Sept 12, 2015, UFO Sighting News. 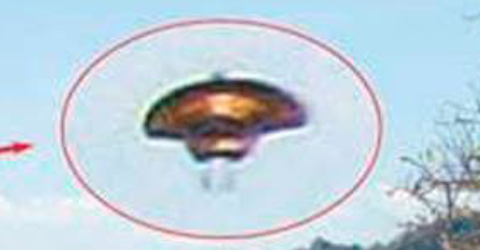 UFO Caught Close Up Over Ocean In Yucatan, Mexico On Sept 12, 2015, UFO Sighting News. A UFO researcher in Mexico caught his first UFO and its detail is one of the best I've seen this year. We can see that its a half disk with a larger lower area. At the bottom there is a clear, white distortion, which looks like its caused by the propulsion of the craft, mixed with the UFO exiting the water and the water dripping off of it. 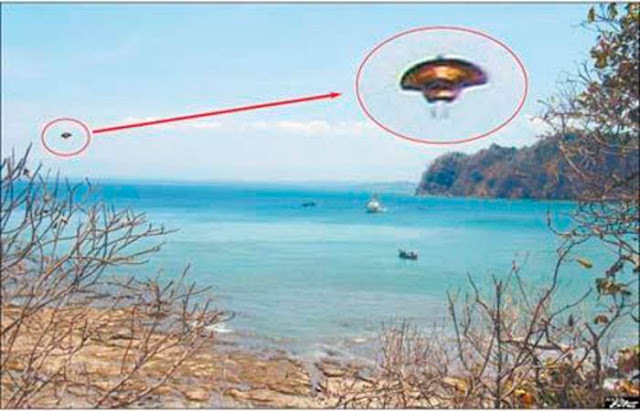 The UFO was caught over the ocean, because it came from the water. Its a well known fact that aliens have bases not below the ocean, but several km below the floor of the ocean. And notice the dark bronze color...extraordinary. An amateur, with 20 years as a student of the phenomenon, but it was not until Friday that for the first time, had a sighting. Jorge Moreno / SIPSE MERIDA, Yuc.- A new report from the presence of an unidentified flying object (UFO) came to me from the port of Progreso: say strange lights appeared two days ago; The odd thing is that for the same dates (September 12), but last year there was also a sighting, allowing speculate on a possible motive for which is given in the same place and date but with a year difference. According to information provided by Manuel Loría Alejos, UFO enthusiast for over 20 years, he says that he went to the port to spend the weekend at his family home is there: "For nearly two decades I have been reading everything about the UFO issue, but until that day I had never seen one until last Friday, when in the company of my dad, my wife, my brothers and my children we could see a strange light on the horizon. "But there was not any light, because I have seen many documentaries and I know when it comes to reflections, aircraft or other logical phenomena to which they can be attributed unidentified label. "It was a strong blue light, which was moving in a straight line first and then making zigzag movements. I was the first to discover it, while we were on the beach, near Yucatan. I immediately called my family to see him because I had the feeling it was not a normal light, which we found moments later, it started making faster movements until after two minutes was up to disappear completely; yes, to an even greater speed. "We were six witnesses and indeed I much excited, because although I believe in life on other planets, it was the first time I saw this, unlike my father, who lived his third experience of this type. "For this reason I decided to immediately send them this report and share it with readers, and so that if someone saw it and report it to give more information that further research be done," he concluded. It notes that in the Yucatan coast has also reported a significant number of UFO sightings, most (80 percent) and Progress stations (Chuburna and Chelem Chicxulub). Unfortunately there is no solid evidence (photos or videos), but a high number of witnesses claim to have seen, including municipal and state police and authorities, tourist service providers, besides the inhabitants. In Flamboyanes station (located a few kilometers before the entrance to Progreso) a couple of years ago various reports were given: neighbors, truckers and people who journeyed there often saw strange lights suddenly did not emit any noise, They are descending vertically and then lost in the sky in the same position at supersonic speed. Airline pilots interviewed say that no plane or helicopter can do these movements, so this is discarded as an explanation for what people saw. In Progreso, in the boardwalk area they have also been several ships with five lights each advancing in training and suddenly reach high speeds and disappear; the control tower Merida International Airport at the time did not report that it was a plane. Another interesting witness got was a well-known specialist in law Merida, who told me with astonishment that has seen at least three times these ships entering or leaving the sea. "I seek no explanation for what I saw, what I spotted this from my summer home in Chelem, even had binoculars, and caused me much impact, certainly the UFO phenomenon does exist," said the lawyer.